8x8 Switchboard Pro is simple to use. You can log in and set up a custom display to suit your requirements. You can log in to Switchboard Pro using your 8x8 username and password. You can also launch the application from Virtual Office. The applications panel launches and shows all 8x8 applications you have access to. Select Switchboard to launch the application. You are automatically signed in. 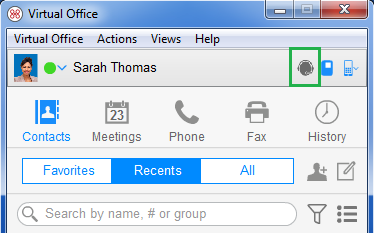 To launch Switchboard Pro, log in to Virtual Office. In the header area, click . The Switchboard Pro console launches. Best Practice: Save the Switchboard Pro URL and launch future sessions from a bookmark in your preferred web browser. Important: 8x8 recommends you log out of Virtual Office while using Switchboard Pro in conjunction with a Polycom IP phone. If you stay logged in, the softphone associated with the receptionist extension also rings and sends alerts for each incoming call, causing unnecessary transactions on the receptionist's desktop. Note: The Switchboard Pro application is limited to a single user. Additional concurrent Switchboard Pro subscription licenses must be purchased for multiple concurrent Switchboard Pro sessions that run on different computers. A user can access Switchboard Pro on several computers and share one subscription license, as long as only one concurrent session is running.